Explore the vintage, consignment and second-hand shops of Venice. Vintage shopping is a growing trend in Venice and, as it has become more popular, the offerings have become more diverse. There are high-end consignment boutiques focused on designer clothing and vintage designer clothing, fun eclectic vintage shops that carry everything from designer clothing to t-shirts, and even two vintage shops that offer mens clothing, leather goods and ties. Happy hunting! For genuine lovers of vintage style! 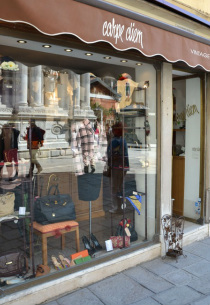 Venezia Bisnonni Clothing is a newly opened vintage shop in the Santa Croce district focused on 1970's Italian vintage clothing, shoes and accessories for both men and woman. Not just another brand-name consignment outlet, there is real vintage treasure hunting to be done here! 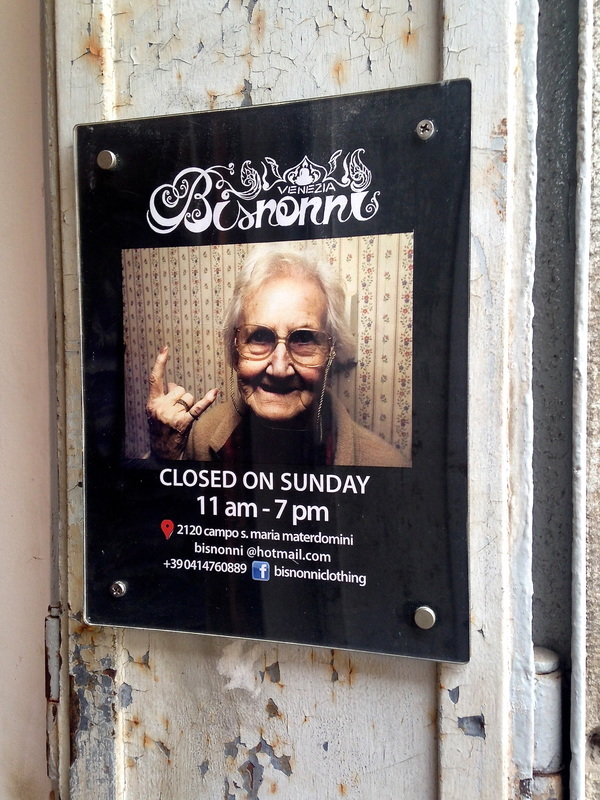 Bisnonni has denim for both men and women, jackets, bags, dresses, shoes and more. Special finds include a rather large collection of vintage swim suits for women and a large collection of denim jackets for men. Prices are reasonable and there are a variety of sizes of clothing available. L'Armadio di Coco Vintage Lab, Cannaregio in Campo Santa Maria Nova. Large vintage shop near to both Rialto and San Giovanni e Paolo. L'Armadio di Coco has a large but well curated selection of high end authentic vintage clothing at reasonable prices. Some outstanding pieces included vintage coats from the 1920's & 30's, designer crocodile shoes and some amazing feather-trimmed lingerie. They also have a nice selection of mens wear including silk ties, hats, jackets and leather goods. There are a big range of prices depending on the maker, period and condition of the pieces, but they are reasonable considering the rarity of some things available here. Carpe Diem, 2516/a San Marco, Campo Santa Maria Zobenigo. A newer vintage and consignment boutique in Venice and the only store in town to focus exclusively on high-end designer consignment. 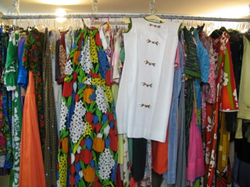 A collectors dream, this shop has a wonderful selection of vintage designer clothing, all of it in excellent condition. When last checked they had Chanel suits, Valentino dresses and Gucci handbags to name just a few. Naturally, these coveted collectors items are not cheap. But, If you're into vintage designer clothing it will be worth every dime. Laura Crovato, 2995 San Marco, On Calle Botteghe, Near Campo San Stefano. Laura Crovato's vintage clothing shop can be thought of as the Venetian equivalent of Manhattan's famous "Cheap Jacks." Crammed into this two room shop is a huge array of women's vintage clothing ranging from day and evening dresses to shirts, sweaters and slacks. Styles available span decades and designers and the prices, when last checked, were extremely reasonable. La Maison de La Sireneuse 2614/A San Polo, On Rio Terra dei Frari. The name may be French, but La Maison de La Sireneuse, or “House of the Serenissima”, is definitely Venetian. This little shop is packed with both vintage treasures and modern delights. Here you'll find a wide array of objects ranging from vintage jewelry through handbags and tea sets all in a bright and colorful jumble. Aldo Strasse 6549 Castello, On Calle del Caffettier, Near Campo San Giovani e Paolo. Aldo Strasse is a vintage and second-hand shop in the Castello district of Venice. 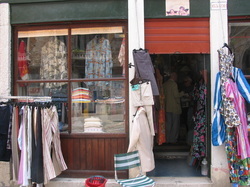 It is one of only two vintage stores in Venice that includes a selection of men's clothing. Men's t-shirts and sport shirts make up most of the inventory. 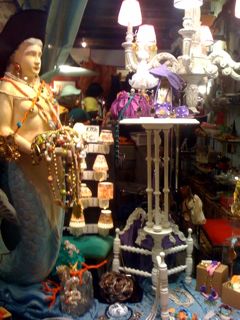 This is a quirky store with a charming proprietor and a good selection of fun vintage items.